It was a Friday night at Camp North End when another unsuspecting customer fell into Lady Go-Go's trap. 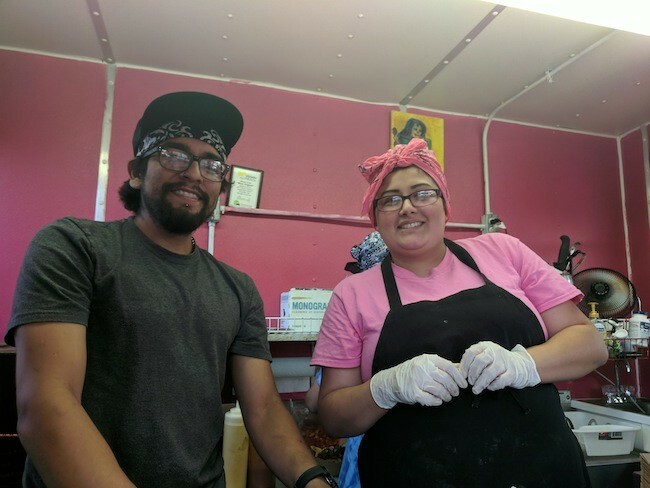 Josh Padgett ordered the Macho Nachos from Yvette Gomez's food truck, which she runs with the help of her husband, Eric Garcia. He was reluctant to choose Lady Go-Go's, which prides itself as Charlotte's only vegan Mexican cuisine food truck. After all, there was a more traditional BBQ food truck just feet away, and Padgett's not a huge fan of vegan food — usually. In the end, he ordered the Macho Nachos with asada — or a soy protein substitute — and a jackfruit quesadilla. He did not come away disappointed. When I spoke to him after he finished, he couldn't believe how big the order of nachos was, but more importantly, he couldn't believe it was vegan. "I'm not the biggest on trying vegan stuff, I need cheese, but had they not told me I would have totally thought it was meat and cheese," said Padgett. "It was really, really good. I really, really liked it and I would definitely go to wherever they are to try it again." Padgett's reaction speaks to the patient work put in by Gomez, who spent nearly two years perfecting the Mexican recipes of her late grandmother. She went through countless different variations until she found the perfect substitutes for each meat and cheese included in the foods she had been cooking her entire life until she went vegan in 2013. 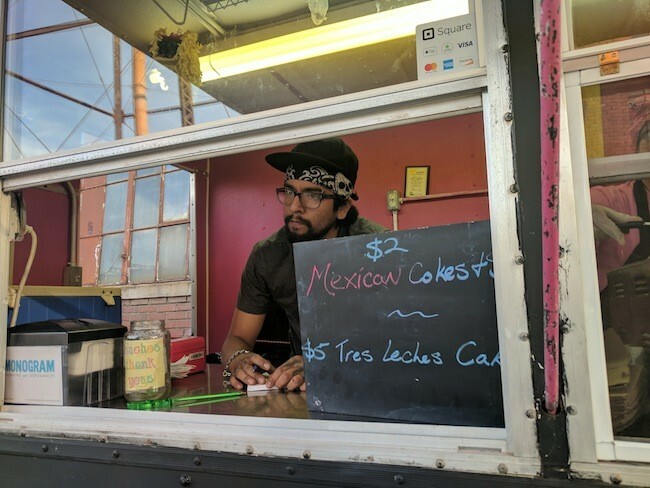 Now, the couple serves zesty tacos, packed burritos and filling quesadillas to customers who — though they might approach the truck skeptically — rarely ever leave unhappy. "We've had plenty of people who bring their friends or even their husbands to try it without telling them that it's vegan," Garcia said. "Having complimented and loved it, and then told that it was vegan, they're like 'There's no way that was vegan.' It was vegan, I promise you." Garcia and Gomez, middle school sweethearts who moved to Charlotte from Houston, Texas, in 2012, began cooking up the popular recipes as a way to connect back to home. Gomez had grown up in Los Angeles before moving to Texas and meeting Garcia. Both first-generation Mexican-Americans, the two couldn't find the strong Mexican food scene they knew in California and Mexico. "We weren't impressed," Garcia said, laughing. "We even went to a restaurant and tried to find tamales before we were vegan. They told us, 'We serve them but we open them and cover them in queso and nacho cheese,' I'm like, 'No, that's not the way you're supposed to do it.'" And so they tried making their own tamales. Gomez, whose maternal grandmother was a cook and paternal grandmother was a baker, decided to try out some recipes passed down from the former, who had passed nine years ago. She cooked up some tamales, and Garcia was blown away. The two then started handing the tamales out to neighbors in the Indian Trail community where they both still live. Then Gomez started selling them out of her car. That venture eventually turned into Lady Go-Go's Eats & Treats, a small catering company that was named after a mix of two nicknames that Garcia has for Gomez. The two didn't yet have a truck, but would work at events in Union County. Veganism was still new to most folks in Union County at the time, so they started driving up to Charlotte more often for events like VegFest. 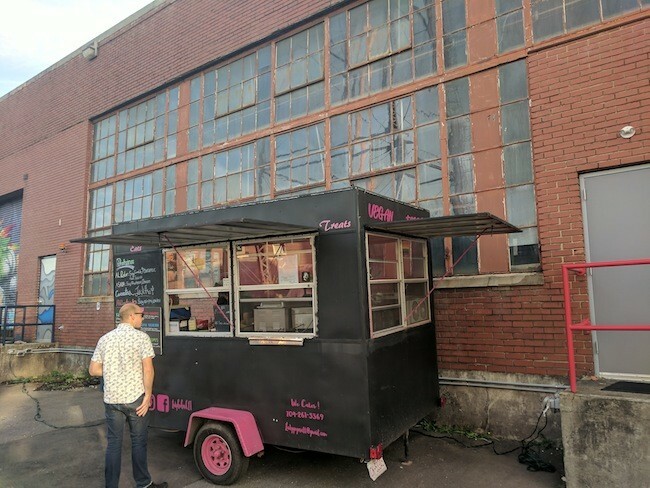 In February 2016, Gomez filed for an LLC and later bought the truck. She is the sole owner of the business, but gets plenty of help from Garcia — and sometimes from the oldest of their five kids, who range in age from 15 to 2 years old. Eric Garcia (left) and Yvette Gomez in the truck. Now, the couple are not only able to get a small taste of home, but to share it with their new community. "We wanted to get the perfect taste and that texture, kind of like I remember growing up, and what [Garcia] remembers growing up," said Gomez. "And now we're here, and when you taste everything it tastes just like it would back then." Garcia picked up where Gomez left off. "For me, what they always say is that taste is associated with memory," he said. "And there's a lot of flavors that we've been creating that just send me back 20-some years, spending summers in Mexico or growing up in Houston. It's nostalgia." It's clear from the menu that the two are having fun with the rebranding of their traditional Mexican fare. The homemade hot sauce — and we mean hot — is called Y.O.L.O, while the more mild verde version is called Guacaflaka. But before the two can make new memories, they still have to convince other folks that their food is worth a try. The two, who prep most of their food in a kitchen before bringing it out in the truck, said they spend much of their time on sites trying to convince people that it's not just plates of tofu that they're serving. The two recalled one especially reluctant man on a recent evening outside of a brewery in Waxhaw. He finally budged, and when Garcia was walking through the bar later, the man stopped him to tell him how amazed he was by the food. After dealing with such skeptics, the couple said it's a relief to attend more vegan-friendly spots, like their upcoming afternoon outside of Comic Girl Coffee on Oct. 21. While it wasn't their goal to begin with, the health kick that comes with serving vegan meals doesn't hurt for the community. Garcia pointed out that, while the food tastes like comfort food, it's comforting in its implications for customers' wellbeing too. "In our culture, it's very heavy in fats and cholesterol and diabetes and heart problems, and etc., so that's also our goal is to be able to bring our flavors back to our traditional space, offering a healthy alternative," Garcia said. "Even though we're not trying to be healthy, we want people to know that ours is a healthier alternative without sacrificing flavor." And if the tacos they were serving up at Camp North End on that recent Friday were any implication, that shouldn't be very hard to do. "There's even people that sometimes stand off, and they say, 'Ehhh, not so much,' Gomez said. "But all you gotta do is try it. You'll be impressed. You gotta convince them to try it, but in the end, it's awesome."